All of my tours are private, unique and customized to the personal tastes and preferences of each client. After gathering information about your preferred wines, types of properties desired and other pertinent details I will draft an itinerary for you to review. After receiving your feedback I will make any necessary adjustments and begin making the arrangements with the properties in question. All passengers on a wine tour outing must be at least 21 years of age. The rate is $85 per hour which includes all taxes etc. There is a 5 hour minimum and the gratuity is at your discretion. There are many lunch options to consider such as a regular sit-down meal at a local eatery, a food and wine paired luncheon at a winery property or a simple picnic lunch at a vineyard if weather permits. 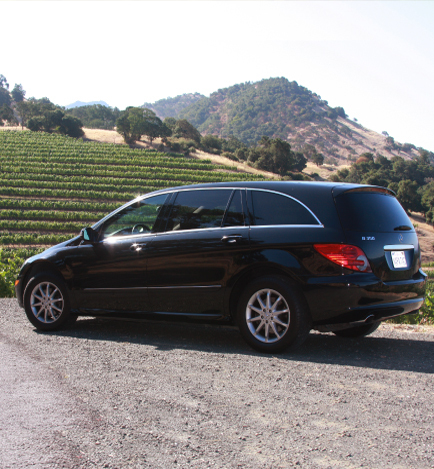 Typically wine tours will range from 5-7 hours in length and will usually include 3-5 wineries. Most wineries have a tasting fee from $20-$40 per person, many refund the fee with certain purchases. 1:00 lunch reservations at Cindy's Backstreet Kitchen. A local's favorite featuring an eclectic, seasonal menu prepared with fresh local ingredients. 2:30 appointment at Duckhorn. Two tiers of sit-down tastings are offered and are conducted either on the wrap around porch or the tasting salon in an elegant yet relaxed atmosphere. 3:30 appointment at Larkmead Cellars. Rich in history and extremely well respected within the wine community, this family run winery is a consistent producer of outstanding and hard to find wines. Tastings are private yet informal.